Everybody working in the field of sports knows that one critical factor to develop and perform is to get in the zone. The zone is that state in which one feels optimal to perform. He/she feels confident, free in mind, looking forward to the challenge, in short everything that’s needed to perform the best that he or she can. The question of how to get in the zone and how all the psychological constructs relate to each other herein have been aching my brains and that of youth coaches in football (soccer) for quite a while now. Most of us are aware of the IZOF, the inverted U and other theories about performing. Those were groundbreaking insights on which I now try to build further, with relating the different psychological constructs in a logical manner – so there’s a clear picture to derive practical tools from. In this framework expectations are key. Expectations are what an athlete expects from himself, what an athlete believes his teammates and coaches expect and what an athlete believes press and audience expect. These three subjective views determine the degree of expectations. Expectations can be sky high (e.g. England win every World or European Championship Football), however that doesn’t mean they have to have a detrimental effect upon development or performance. Expectations can be met by confidence an athlete holds within himself or his team about their ability on such a task. Self-confidence consists of mainly state confidence (specific task confidence: penalty kick) and of trait confidence (overall confidence: as a football player). Expectations and self-confidence are thus related to each other. This relationship leads to three different states in an athlete before any given task. 1. If expectations clearly exceed self-confidence the athlete will experience pressure and anxiety to perform. 2. If self-confidence clearly exceeds expectations the athlete will experience nonchalance and perhaps even disinterest to perform. 3. If expectations and self-confidence match each other the athlete will experience a healthy tension to perform. That’s when he’s in the zone. And being in the zone is what an athlete needs to look for. Expectations should slightly exceed self-confidence so that an athlete experiences a healthy dose of tension that triggers his body to get ready for optimal performance. He becomes cognitively and physically sharp to perform. On top of that, in order to succeed he has to work hard and as a consequence learns to value working hard to develop and perform. As a coach it’s possible to help balance this relationship. During training the coach can match the task/challenge to the ability level of the individual player. If the coach is able to do this he will stretch the ability of the player as the player is in the zone of optimal development and performance. The foregoing relationship of getting in the zone is probably applicable to the majority of players. However as every player is unique, other sorts of zones to perform are known. For example some athletes and teams thrive when expectations are low. In the Dutch Premier League RKC Waalwijk is a good example of this phenomenon. RKC Waalwijk has a budget that ranks them 17th out of 18 clubs in the Premier League. Hence, it’s no surprise they have to struggle against relegation every season. What is a surprise is that they gather most points playing against the top 9 of the league, at least at home. In last three seasons they gathered 3 points more against top 9 clubs than they did against direct competitors (ranked 10th – 18th). Dutch giants PSV Eindhoven (2nd budget), Feyenoord (4th budget) and Vitesse (5th budget) haven’t won at RKC Waalwijk in those 3 years, PSV and Vitesse lost all 3 matches, Feyenoord lost 2. After beating PSV at home this season RKC captain Duits told the press that they ‘feel less pressure playing the giants of the league’. In this case the expectations drop so much that self-confidence is about the same level and the pressure is either gone or little. It creates a nothing to lose and everything to win feeling for them. This phenomenon might also partly explain the success of Guus Hiddink with South Korea during the World Championships Football in 2002. South Korea doesn’t have an impressive history in football, with having qualified only 5 times before 2002 and never reaching beyond the group stage. With wins against Italy and Spain in the knock out stage, South Korea surprised the entire football world by only being stopped in the semi-finals, as Germany beat them 1-0. As no one could have dreamed South Korea to reach this far, the expectations were low and in balance with self-confidence so little pressure on Hiddink’s equipe existed. Again that feeling of nothing to lose and everything to win probably emerged. Now that I’ve made my point, let’s elaborate on the framework. It is both a way to understand and how to get in the zone as it is to have an image of how all sport psychology subjects and mechanisms are related to each other. Table 1. Framework of getting in the zone with an overview of sports psychology mechanisms and their relationships to each other. There’s more to it, just the core aspects are represented here. Expectations are created by a lot of things, an athlete’s own goal setting is one of them. Goal setting can help lower or rise the expectations of himself or of those of others (press, audience). Goal setting can be seen as a tool to adjust expectations in order to make the formula right and to get the athlete in the zone. José Mourinho and Louis van Gaal are experts in lowering expectations of the crowd on their players by stating they’re not the favorite but rather the underdog in a match or competition. Besides they are also masters in shifting the focus from their players to other irrelevant topics not concerning them. Growth mindset is a powerful tool to create self-confidence. With a growth mindset an athelete is convinced that qualities are malleable. How then does this raise self-confidence? It does because the athlete is aware that his ability level can be raised and is not fixed. If it were fixed the athlete can either perform a task or he can’t, there’s no room for improvement or future success. With a growth mindset the athlete is aware that he is able to raise that ability level through learning, working hard and practice. This raises self-confidence because the athlete knows he can overcome challenges and tasks, even if he can’t overcome those right now. What if we have tried to match the relationship, to solve the formula, but it didn’t work? Just before the match the athlete experiences pressure or anxiety to perform. If this is the case an athlete has trouble to focus. One tool athletes can make use of is breathing exercises. Athletes can monitor their breathing and bring their breathing down by using their belly instead of their chest while inhaling. Because our brains become somewhat blocked when feeling pressure and anxious, taking deep breaths through the belly resolves the blockade by addressing those brain parts involved in relaxation, concentration and focus. Dealing with pressure is a form of ‘curing/coping’, whilst with this framework a lot can be approached or prevented by adjusting the expectations and self-confidence. Often it’s not the content of a message that makes us feel bad, angry or sad, but it’s the why people say it to us. If I get told what I’ve done wrong and how I should improve, most of the time I’m aware of it myself and I can agree with the content. But if I have the feeling the reasons that person is telling me aren’t in my best interest I feel a resistance to listen to him and pick up his instructions, although they might even be the right thing to do! This often is the case in sales where people want to be helped in their needs and not helping the salesman achieving his targets. But also in coaching it can happen. Let me clarify this a bit more. We have expectations about the reasons someone tells us something. Especially considering feedback it is important to be aware of this. For example, when peers in a high performance climate are coaching each other, suspicion among them might arise. Take Duncan who gets feedback from his teammate Johan. Even if Johan delivers his feedback in the right way Duncan might not pick up this feedback, for other reasons than not being able to. It could be Duncan might not want to listen because he believes Johan wants to express his superiority over him by pointing out Duncan’s mistakes or shortcomings and knowing better. In this case Johan has to clarify his intentions are in the best interest of Duncan (wanting to help him to perform better, to win the game together). 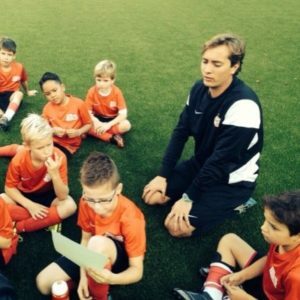 Kids might not be able to do this, so the coach plays an important role. By creating a mastery climate (a focus upon development instead of being better than others) a big deal is done to this already. For anyone working with kids make sure your motivation is clear to them, because kids can also be resistant to a coach’s feedback. Your motivation to work with kids and give them feedback/advice should and probably is to help them improve, to see them develop. For reasons, sometimes nothing to do with you, the kid might not see your true motivation to help him. By stressing out your purpose with the kid (to develop him the best you can), coaching the right way (emphasize effort, point out good behavior, indicate what went wrong, ask and then give instructions how to do it better next time and have a positive outlook for the future) and be the right example yourself (be vulnerable, admit it when you’re wrong or make a mistake and learn from them and feedback by others) your kid will probably see your true motivation in coaching him and will start to listen and improve. I believe expectations to be the number one reason why people have problems with communicating to each other and experience disappointments. By acknowledging it’s crucial role I am convinced you can save yourself from a lot of unwanted and unnecessary trouble! Want to learn more about this framework plus the given psychological constructs and where other (psychological) constructs – e.g. injuries, leadership, creativity, willpower, self-regulation – are placed within? Feel free to contact me!